In one episode of the Dragon Ball Z anime, Bulma the wife of Vegeta makes Saiyan chest armor for Goku, Gohan, Vegeta and Trunks. Pictured above is a full size papercraft of that armor by Dancin_Fool at 405th.com. As explained in the series, Saiyan armor is built from a thin, elastic material that expands to fit the wearer. 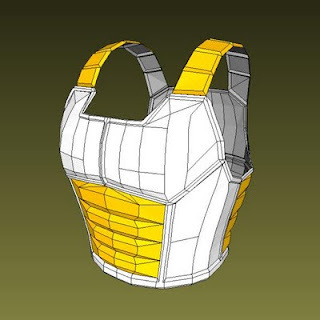 The template for the armor is available in Pepakura PDO format only and may be downloaded here. Indiana Jones' weapon of choice in Indiana Jones and the Last Crusade is a Webley Mk VI revolver. Although the movie takes place in 1938, the Mk VI is an older weapon which, starting in 1915, was issued as the standard sidearm for British troops during World War I. 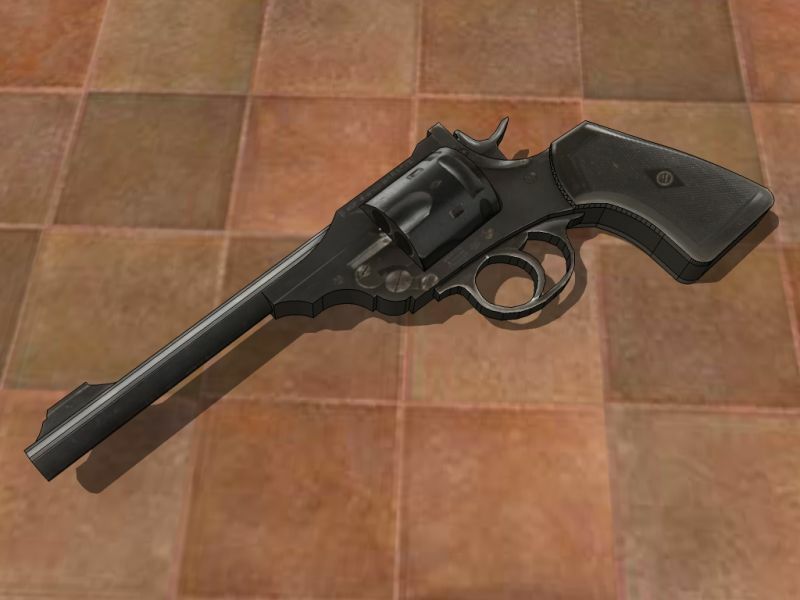 My papercraft rendition of the revolver takes some "artistic liberties" in the name of making the paper model easier to build , but I worked hard to keep the 1:1 scale of the gun accurate. This is the one and only papercraft I have ever released without a test build first, so let me know if you find any problems. The template may be downloaded here. Estimated difficulty level: 4/5. 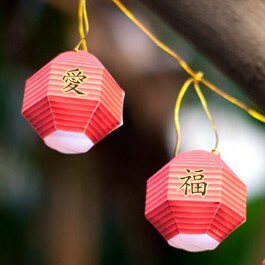 The Disney Family Fun website offers these printable paper lanterns as a Chinese New Year item, but I think they would be pretty cool any time of the year. ^^ From the looks of the unfolded pattern, I would estimate the finished lanterns to be only about 2.5" (6.4 cm) tall. The PDF template file for the lanterns may be downloaded here. 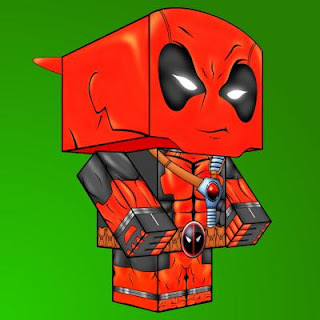 There are quite a few Deadpool cubees around, but this one by Randyfivesix is my favorite. Although not pictured above, this paper toy includes Deadpool's signature katana swords. The two pages of the template are available here and here. Deadpool is a Marvel Comics character created by artist Rob Liefield in 1991. 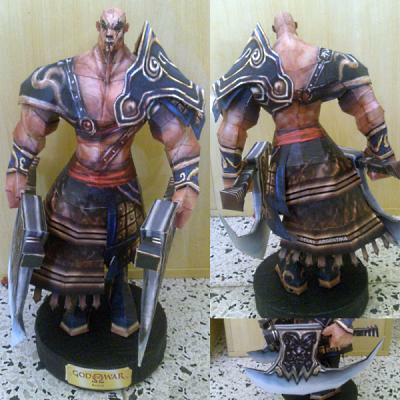 I have seen quite a few papercraft models of Kratos (the main character in the God of War video game series) but this is the first one I have come across that looks to be based on a 3D model from the game. The finished model stands around 12.6" (32 cm) tall and comes with the two axes shown (display stand not included!) The template (located here) is offered in Pepakura PDO format only. The template and build photos above are by Delay. 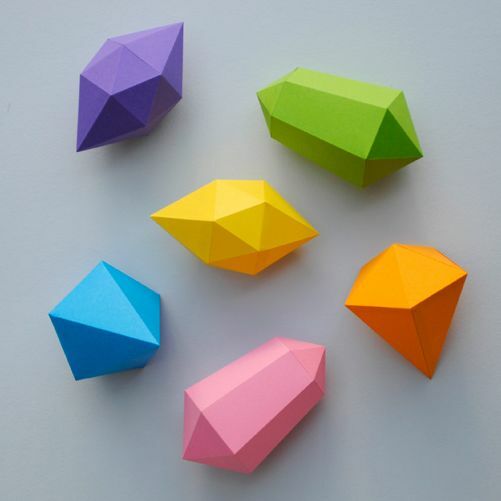 Here are some simple, but beautiful papercraft gemstones from Kate at the Minieco website. As you can see, Kate loves brilliant colors. 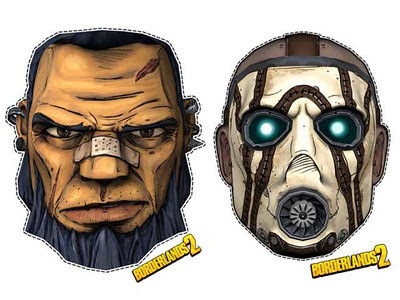 ^^ These gems were created by printing a blank template on color cardstock. There are many uses for the gems including Christmas decorations, mobiles, and garlands. Also available at Minieco are templates for platonic solids. The templates for the gems are located here and the templates for the platonic solids are located here. 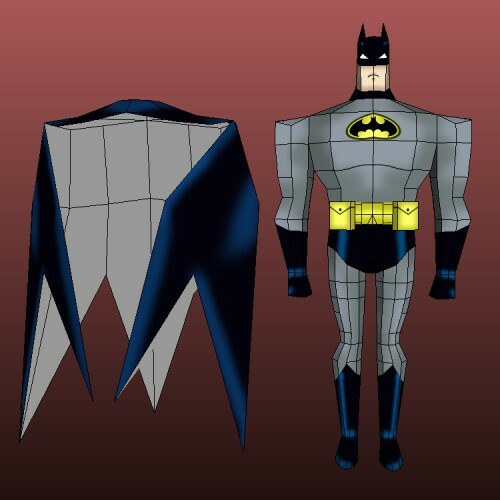 I was unable to find much information on this Batman papercraft I came across. It looks like it may have been modeled after one of the Batman animated TV series from the 1990's, but whether it was created from scratch or from a video game 3D model I can't say. The PDO file for the model says it was unfolded by "Cuguel" who may be the same person who was involved in creating the Alien xenomorph life cycle papercraft I posted a while back. 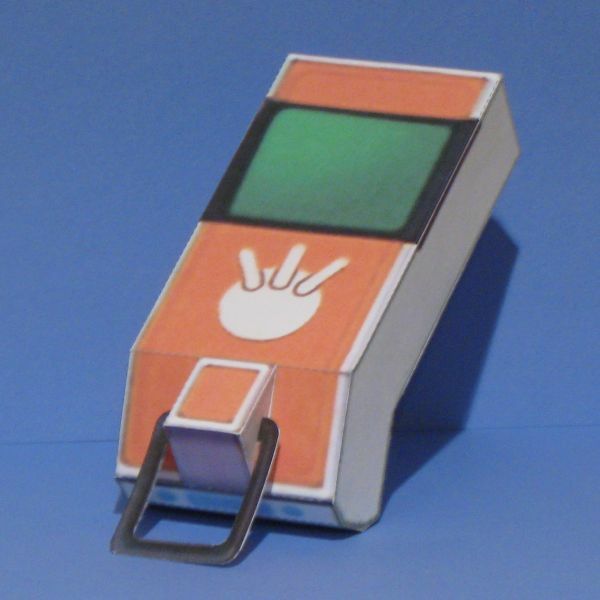 The Pepakura template for this paper model is available here. "The V-wing airspeeder was a combat airspeeder developed by the New Republic to replace aging cloud cars and allow more expensive starfighters to focus on space combat... 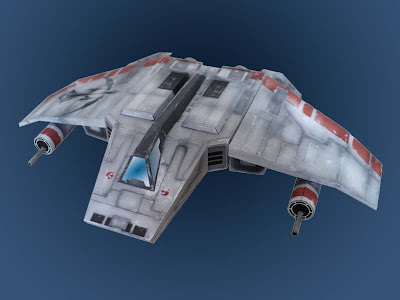 The V-wing's weapon systems had two fire-linked blaster cannons on either side of the vehicle with an effective range of two kilometers." The simple template and detailed instructions for this model are the work of Imclod at deviantART and may be downloaded here. The Portal 2 video game introduced a robot known as a "frankenturret". A frankenturret is something like a cross between a weighted storage cube and a sentry turret. 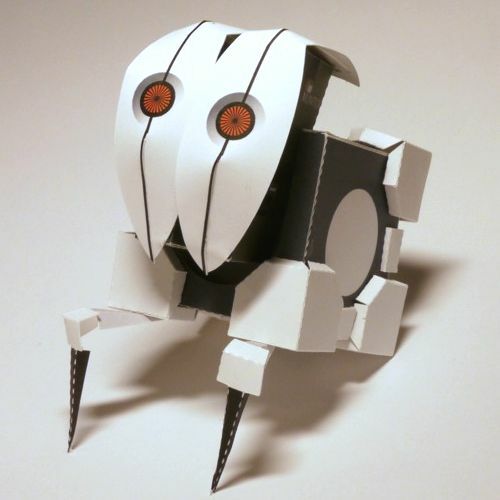 Markus, the creator of this frankenturret papercraft, admits that the model is "somewhat finicky to assemble", but if you remain undaunted by this information ^^, you can download the template here. 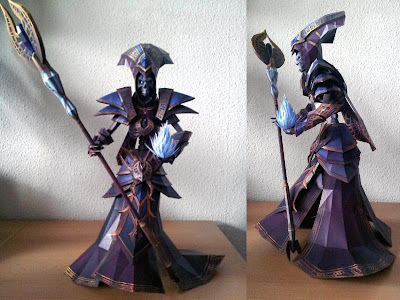 Destro2k at DeviantART has created an exquisitely detailed paper model of a lich. In fantasy literature a lich is an undead creature that, unlike a zombie, retains the intelligence it had as a living thing. 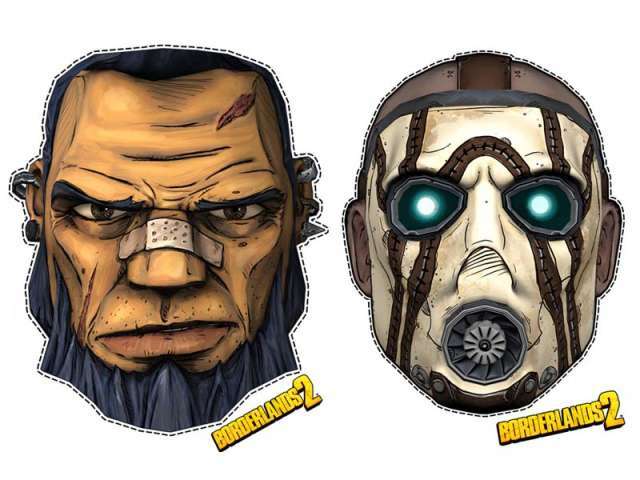 This papercraft is based on an original 3D model by DeviantARTist FirstKeeper and not a model ripped from a video game. The Pepakura PDO files for this paper model may be downloaded here. The Alhambra palace in Granada, Spain is an example of the Mudéjar style of architecture. Mudéjar architecture is a mixture of European and Moorish architectural elements that resulted from Christian and Muslim cultures living side by side in Spain from the 12th through the 16th Centuries. 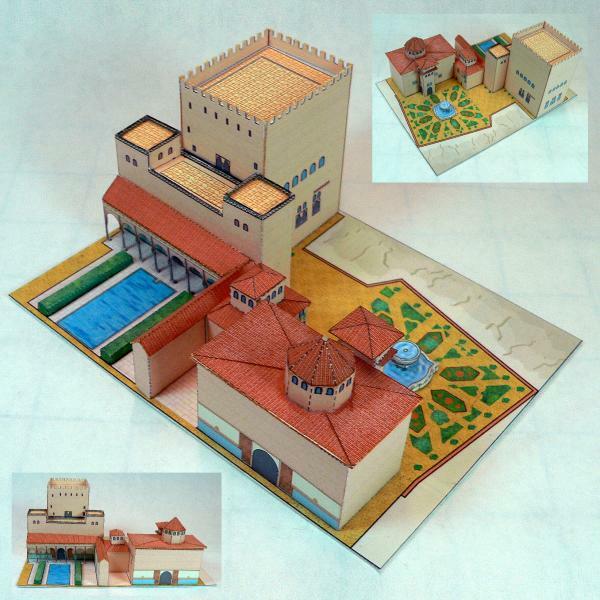 This easy-to-build paper model of the Alhambra is offered by the bastelbogen-online website. Other free papercraft offered by bastelbogen-online include Roman helmets and a series of Roman watchtowers. Valentine's Day is closer than you think! 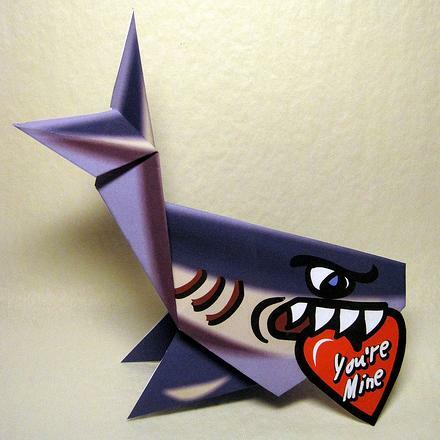 This aggressive shark valentine is part paper toy and part origami. The printable template and instructions by Jacque Lynn Davis are located here. Also available are an origami shark without the heart and a blank shark template you can color yourself. In Star Wars Episode IV during the battle to destroy the Death Star, Darth Vader pilots an advance prototype starfighter known as the TIE Advanced x1. Unlike most TIE fighters, this particular version was equipped with a hyperdrive. 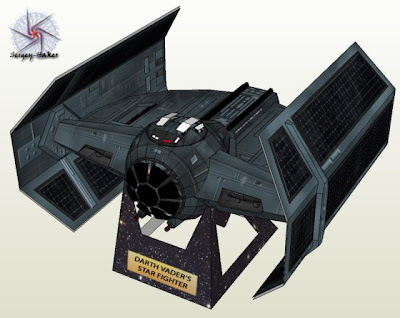 This paper model of the TIE/x1 is the work of Sergey-Haker at swmodel.ru. The template may be downloaded here. 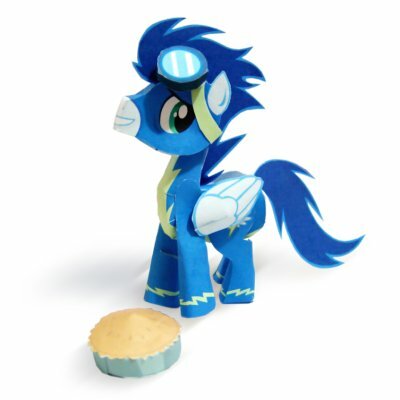 UPDATE 12/25/15 - The original version of this model is no longer available. The link has been updated to point to an improved model by the same designer. After doing a papercraft Dwemer puzzle cube, I couldn't resist making another cube from The Elder Scrolls V: Skyrim video game. This time it's a runed lexicon cube. This papercraft is the appearance the lexicon takes after being inscribed with an elder scroll's knowledge in the "Discerning the Transmundane" quest. The template for the cube may be downloaded here. Once again, special thanks to Paperjon for providing the textures for the model. Vintage paper toys always bring a smile. 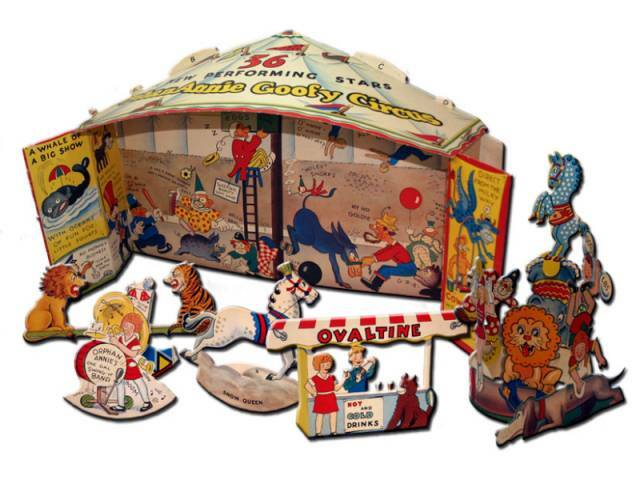 ^^ This Orphan Annie Goofy Circus was a mail-in offer by Ovaltine in the late 1930's. Scans of some of the circus pieces may be viewed at a here. C. Carey Cloud was the designer of the papercraft. Cloud is probably best remembered for his work as a Cracker Jack prize designer. He produced toy designs for the snack company for thirty some years from the 1930's to the 1960's. 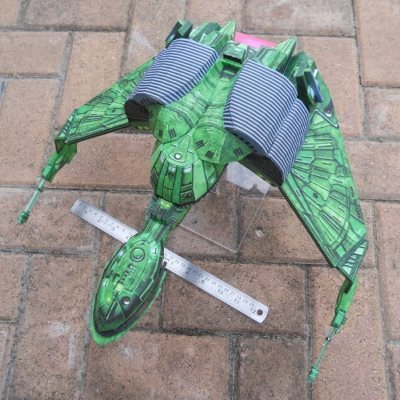 The Romulan Bird of Prey is one of my favorite starships in the original Star Trek television series. This well designed paper model of the ship by Horissman even includes landing gear. The PDF template for the model (which contains detailed assembly diagrams) may be downloaded here. The build photos above are by Josh (aka Sidewinder). 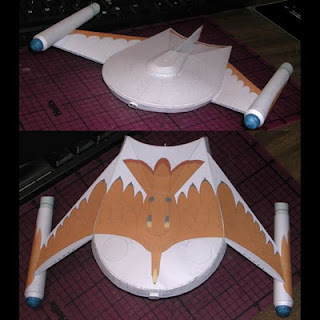 In a previous post I featured a papercraft Romulan Warbird, also on my list of favorite Star Trek spacecraft. The fifth series in the Digimon television franchise is Digimon Data Squad (in Japan: "Digimon Savers"). The lead character of the series, Marcus Damon (in Japan: Diamon Masaru), makes use of a device known as a Data Link Digivice (in Japan: "Digivice iC"). 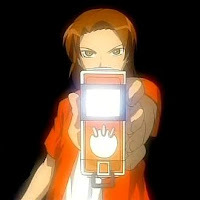 The device allows digimon monsters to "digivolve" into more powerful versions of themselves. This 1:1 scale paper model of Damon's digivice (my first release of 2012!) was based on a 3D model from the Digimon Masters MMORPG. The lined and unlined PDF templates may be downloaded here.